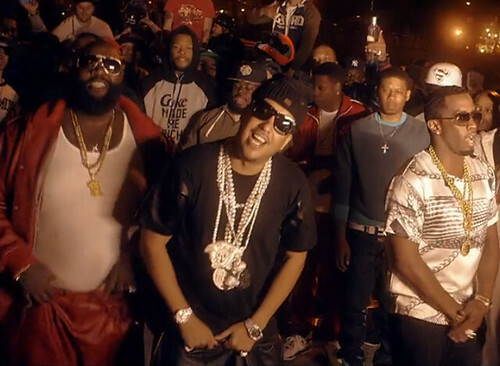 French Montana returns to the hood in “Ain’t Worried About Nothin,” a cut off his Excuse My French debut album. The Coke Boys general brings out his yellow Lamborghini through the streets of his Bronx, NY hometown. As expected, the locals come out and show love to Montana, as Diddy, Rick Ross, DJ Khaled, and Vado, make cameos in the Elf Rivera-directed clip. Arriving on May 21 (pre-order on iTunes), Excuse My French includes appearances from Diddy, The Weeknd, Lil’ Wayne, Drake, 2 Chainz, Ne-Yo, Raekwon, Snoop Dogg, and Scarface. Expect his new single “Gifted” with The Weeknd to arrive soon, check out the artwork here. Watch French’s new video below…..